This is stage four of the Hit The North expedition. 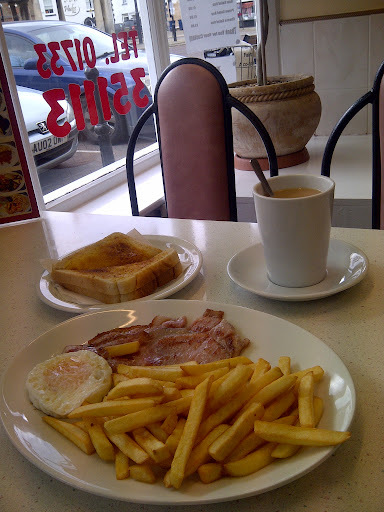 I arrived in Whittlesey and stopped off at the Sunshine Cafe for a fortifying fry-up. …and passed by the intersection with Morton’s Leam. The Leam, which runs all the way to Peterborough, was first cut in the 1480s, the work was funded by the bishop of Ely, John Morton. Gazing down the Leam was probably the highlight of the walk, everything afterwards was somewhat grey and dismal. The path took me alongside the River Nene, unfortunately the path also runs alongside a busy road. The clouds were grey and turning to a threatening black towards Peterborough. Eventually, after what seemed like miles and miles, I left the busy road and took a quiet paved path along the bank of the Nene. I caught sight of Peterborough cathedral in the distance and watched a hawk hovering over a field but these sightings were not enough to lift my fast fading spirits. Feeling fed-up and demoralised by the grey clouds, spitting rain and dull countryside I turned to my ‘smart’ phone and on YouTube found some swinging bop by Shelley Manne and his Men. After a few minutes the tune had loaded and suddenly the greyness abated and was replaced by a rainbow of lush jazz sounds. Immediately my mood lifted, a smile appeared on my face, a tuneless whistle leapt from my lips and the world was good once more. I finally began the walk into Peterborough. The Peterborough waterfront is somewhat neglected, as if the town doesn’t really want it there at all, a shame really. A few neglected boats, piles and piles of bird crap, litter and stuff. Where’s the riverside cafe? The friendly pub? Nothing. Nada. Leaving the river I headed towards the train station, stopping off at a charity shop along the way where I purchased a warm and furry ‘trappers’ hat for my winter walking, a bargain at £7. On the train home I chatted to a five year old boy about Thomas the Tank engine. This was not a particularly enjoyable walk, not helped by the horrible weather. 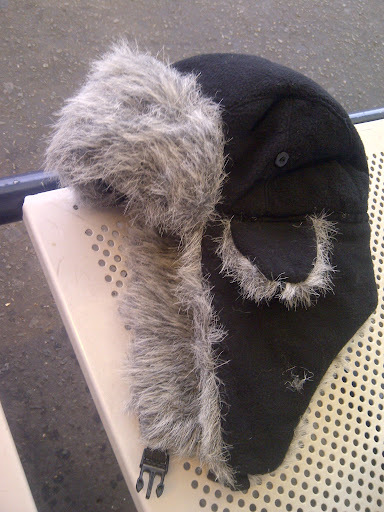 The highlights were the fry-up in the Sunshine Cafe, Morton’s Leam, jazz on the Nene and the winter hat. Now I’ve arrived at Peterborough the fenland stage of this heroic expedition is just about over and Lincolnshire beckons! Hi Martin. At least you’re honest! Not all walks pass through gems of landscape in perfectly appropriate weather and I really like the concept of this walk. I’m familiar with this landscape from my childhood and even warm sun and blue skies can do little to break the monotony. Indeed, they possibly make it worse. This also reminds me of parts of the Camino de Santiago which I walked this summer; there were times when it was so flat and dull I very nearly quit and jumped on a bus towards the Picos de Europa which were looming, full of temptation, to the north. But I’m glad I stuck with it because it got a lot better. And it will for you, too. Peterborough’s dump but Stamford’s quaint. The shires of the East Midlands beckon! Hi Sian, thanks for your comment. Oh, the Camino, I’d love to walk it one day, starting from somewhere in France. Have you read ‘Camino Diaries’ by Jean Rawlings? You can buy it (eBook) on Amazon for £2, highly recommended. I actually quite enjoyed your post, for it’s refreshing honesty! Sometimes walks aren’t ‘amazing’, ‘awesome’ or ‘epic’ but at least you got out and did it, and made the best of it. I actually miss charity shops (found 2 so far in Oslo) and having a good book rummage. I got a trappers hat last year and it is mighty cosy at -15C 🙂 Enjoy it this winter! Hi Helen, thanks for your comment. What a tough stage Martin. Would have been much more interesting on a sunny winter day when there is skating on the water meadows nr Whittlesey. Pity the path skirted around Thorney and Crowland Abbeys -marvellous medieval architecture on former islands in the fens. Stamford will be a great contrast – almost became the third ancient University in the middle ages . don,t miss Burleigh Park – deer are beautiful. long walk across the park to Burleigh House though . Really enjoyed reading this. I would venture to suggest you took the wrong route into Peterborough from Whittlesey. The cycle path that runs around to the North of the brickyards misses out the busy road along the North Bank of the Nene and it shows off the nature and the Fenland Landscape in an amazing way. It joins the Nene at the Millennium Bridge at the point where the road veers away and you joined the footpath. I do agree about the final stretch into Peterborough. Although once you get there there is a boat, Charters, on the other side of Bridge Street which is a great pub. Enjoy the reast of your walk. Hi Martin, thanks for the comment. Yes, your route makes more sense, glad you enjoyed the post. I thought Whittlesey was a fine town. Back to the Sunshine Café, I think. Double quick. And that hat is cool!